Acquired from the original fashion designer at Kenner, these pieces offer a glimpse into the clothing design of the large (12 inch) action figure line of Star Wars toys. 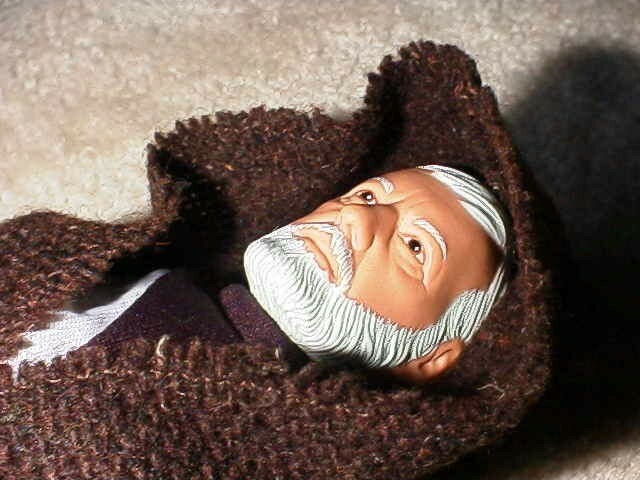 The examples shown here for Ben Kenobi include the original cloak prototype and the outfit, patterns, and paperwork which makes up a Kenner "Quote Sample". 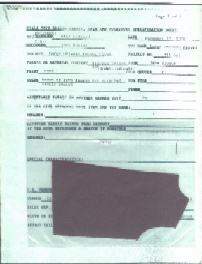 This Quote Sample was stored for over 20 years in the envelope which can be partially seen below. In addition to bearing the Kenner name, the envelope was labled "Hard Pattern, Obi-Wan Kenobi" in pencil by the seamstress from the sewing department. 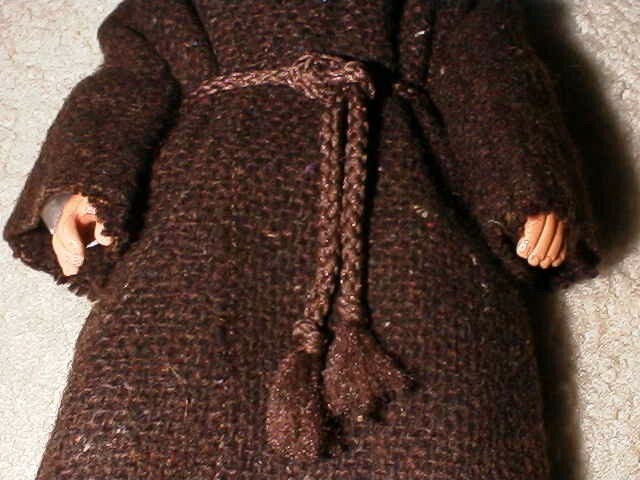 These close-ups show the detail of the fabric on the original handmade prototype for the Ben Kenobi cloak. This piece is made of a completely different material than the production figure and includes a rope belt. The material looks very much like the original wardrobe piece, but it was too costly to use for the toy, so the material was changed. 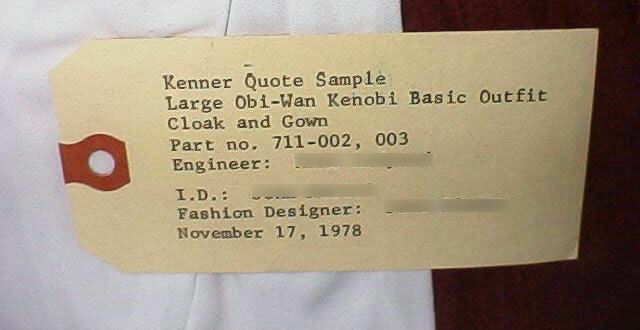 The outfit above is part of the "Quote Sample" that Kenner would give to send out to vendors for quotes on producing the outfit. This outfit was a sample handmade at Kenner and was sent along with pattens and paperwork which included fabric swatches and pertinent outfit information. 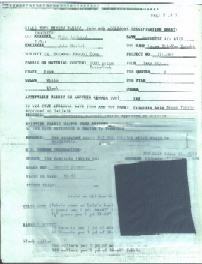 Shown above is the tag which was attached to the sample outfit. 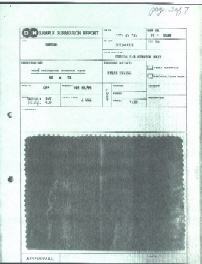 This ensured that the outfit could always be identified if it was separated from its accompanying paperwork. 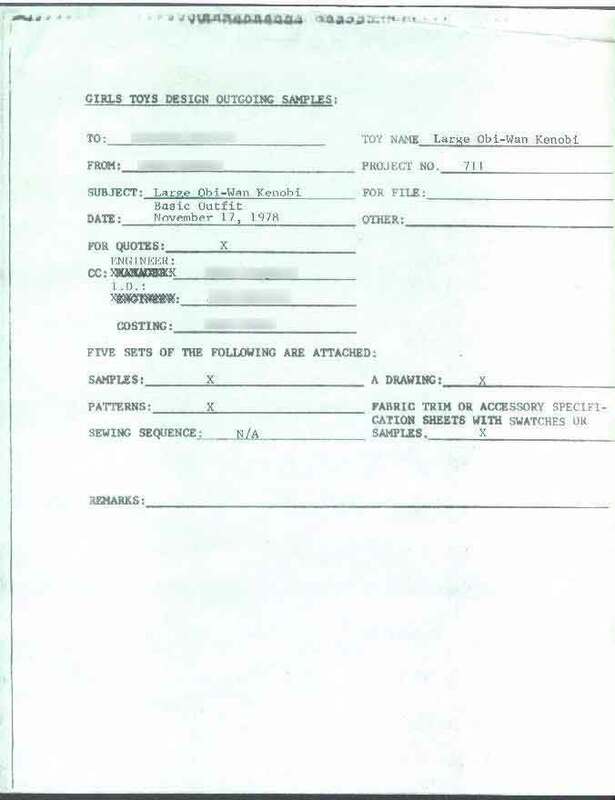 It contains the Kenner project number and the names of the project engineer, fashion designer, and the industrial designer involved in the project. Shown above is an overview of all the pattern pieces. Each one was drawn and cut out by the designer. Every component of the doll's outfit is detailed by a pattern. The patterns are labeled as to what figure they are for and what part of the outfit it refers to. These patterns are all dated 1978 in the designers own handwriting. The seams and cut marks are all noted on these patterns as well. 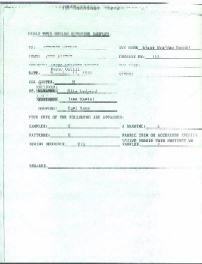 A major component of the Quote Sample is the paperwork shown above as thumbnail images. Click on them to see the full-size scans. 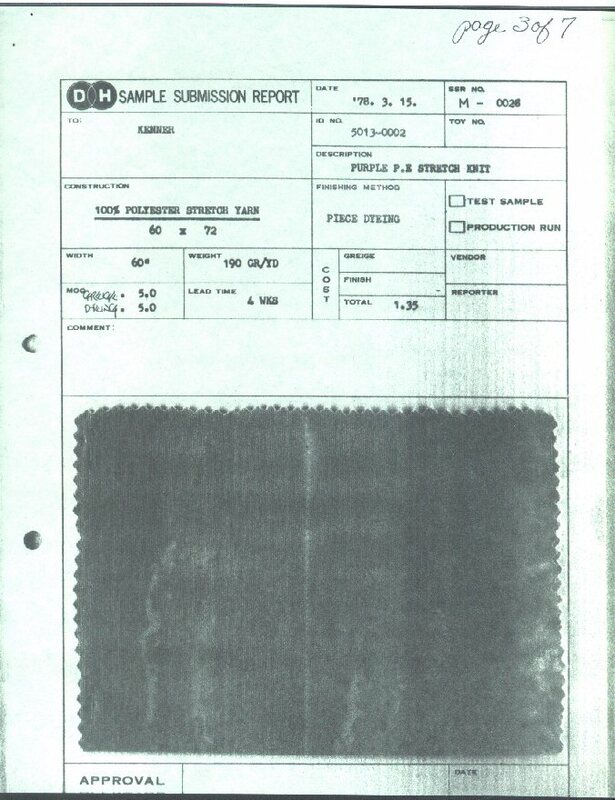 This paperwork goes into detail about things such as the type of fabric to use, the manufacturer of each fabric, and what the clothing yield is per square yard of fabric. Each different type of fabric used on the figure is included as a small swatch stapled to its appropriate sheet. 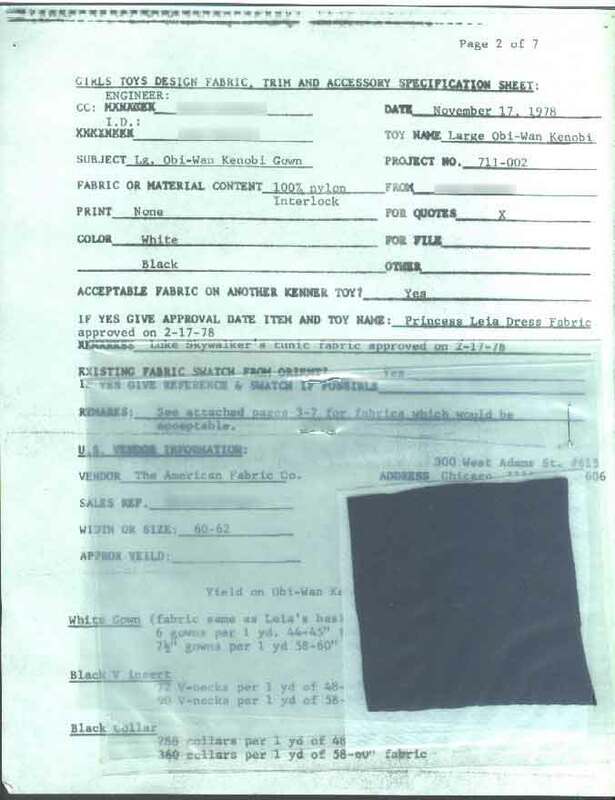 There is one sheet per item of clothing and some of the information noted is if the material has been used and approved for previous Kenner toys. 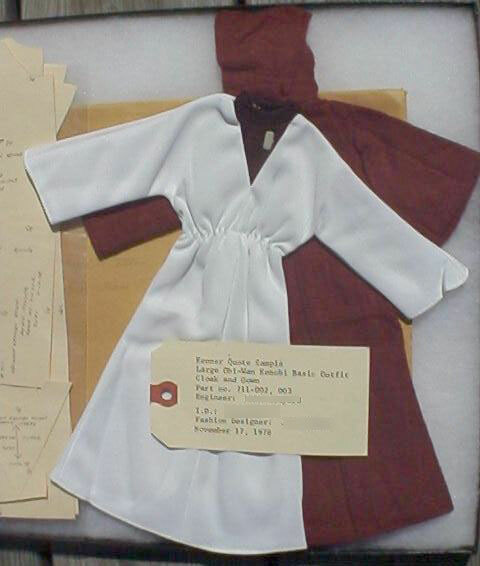 In this case, the white material was used for both the Luke and Leia large action figures which is noted on page 3. 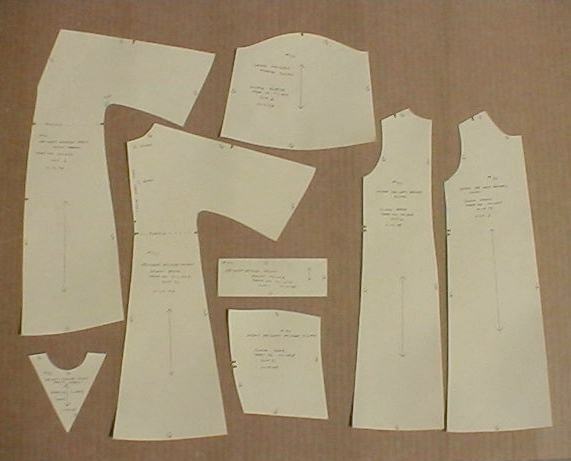 This lot included four additional generic pages similar to page 4 showing alternate fabrics which could be used. Many thanks go out to an anonymous collector and Gus Lopez for finding these and other fashion prototypes for the Large Action Figure line of Star Wars toys. It is through the tireless efforts and dedication of collectors that we are able to discover pieces of toy history like this.